I’ll keep this brief. As the French novelist André Gide said 100 years ago, “Everything that needed to be said has already been said.” Yet because nobody is listening, some things have to be re-said. So Ukraine is on the move again, after a period of watchful waiting. Destabilisation phase 2 is underway. Leaving aside my prediction a fortnight ago that it would happen, and the hard-pressed Ukrainian government’s difficulties in reacting to any civil disturbances whatsoever – the new Ukrainian security services have nowhere near enough personnel to resist what’s going on in the East – the logic of Putin’s moves now is exactly the same as it was in Crimea month ago. Let’s build it up as the Russian president does: co-ordinated weekend (always the weekend) demonstrations and attempts to occupy government buildings; implausibly spontaneous appearances of razor wire, relatively small numbers of violent men in balaclavas and with remarkably standardised equipment (baseball bats, flags, firecrackers, stun grenades; and identical demands everywhere (referendums, declarations of autonomous/people’s republics, request for Russian “peacekeepers” to rescue them). 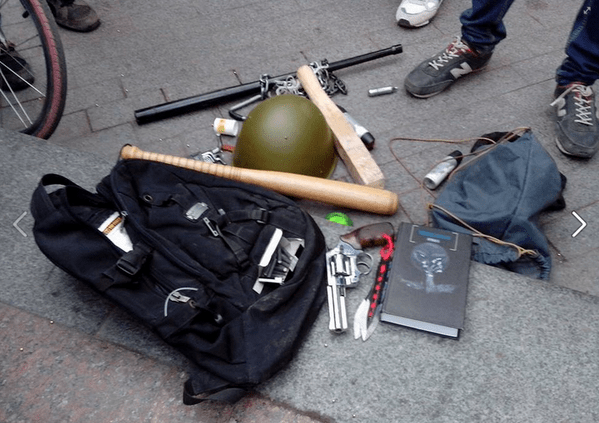 Add to that the photographic evidence of a) unwittingly revealed Russian special forces insignia among these groups, b) cash changing hands, c) the unwillingness of so-called “activists” to identify themselves behind their balaclavas and masks, and you have the elements of a not very clever externally orchestrated attack on eastern Ukraine which will wreak havoc simply because balance is hard won in any society and the complexity of Ukrainian society in particular – Ukrainians, Russians, Russian-speakers, Jews, Moldovans, Tatars, Armenians, Romanians, Bulgarians and so on, intermarried, interwoven – means that many if not most of its citizens will have a hierarchy of loyalties. I believe, from visiting the country for nearly 20 years, that that hierarchy is more interested in preserving Ukraine’s borders as they were before 18 March. The most recent opinion polls show that majorities of up to 70% in the east favour remaining part of a united Ukraine. Tonight miners in the city of Donetsk, a powerfully symbolic group, have also come out against separatism. There is no question that what Putin’s “activists” are trying to do is identical – though not so easy – to what was done in Crimea. But it is part of a larger plan, which is to destabilise the east so badly that there will be no chance of planned presidential elections taking place on 25 May. The worthwhile news is that this time Ukraine and the West are more prepared for these tactics. General Breedlove (NATO’s commander) is talking very sceptically about the troops on “exercise” on Ukraine’s eastern borders at the same time as he is building up capability on NATO’s borders, and Anders Fogh Rasmussen (NATO secretary-general) and NATO foreign ministers have upped their public reaction. There is a US destroyer in the Black Sea. In return, Sergei Lavrov, the Russian Foreign Minister, is demanding answers about NATO’s activities in eastern Europe, accusing it of being in breach of treaty (though ignoring Russia’s repeated breaches of the NATO-Russia Founding Act in which it pledged to respect territorial integrity, sovereignty and so on and so on). But we should not be in any doubt whatsoever about the direction this conflict is mutating in. Destabilisation phase 2 is kicking off, and it will run and run until the Putin plan fails and is contained. Because for the Russian president, free elections in Ukraine in May will mean an independent Ukraine, a self-determining Ukraine – a sign not only to the Ukrainian people but also to the Russian electorate that protest against oppression and corruption can succeed. To Putin, this is impermissible. So he will go as far as he can to stop it – provoking outrages, playing the ethnic Russian card all the way, creating the circumstances of unrest that “justify” Russia invading east and south Ukraine before completing a pincer movement to save ethnic Russians in Latvia in the north. He has a basket-case economy but still has the necessary armed strength and an increasingly enclosed mentality to do it. Now the EU, US, NATO must stop him hitting the ground running, leaving us gasping and struggling to respond again. Europe’s future stability and wellness, as well as Ukraine’s, depend on it. A footnote to UK news coverage of the Ukraine crisis, particularly by the BBC: It would be helpful if the BBC and other news organisations could begin to investigate the true identities and motives of the “pro-Russian” activists they talk about so easily, instead of swallowing the story at face value. That does not count as impartial reporting: it counts as superficial, inadequate, dangerous journalism.